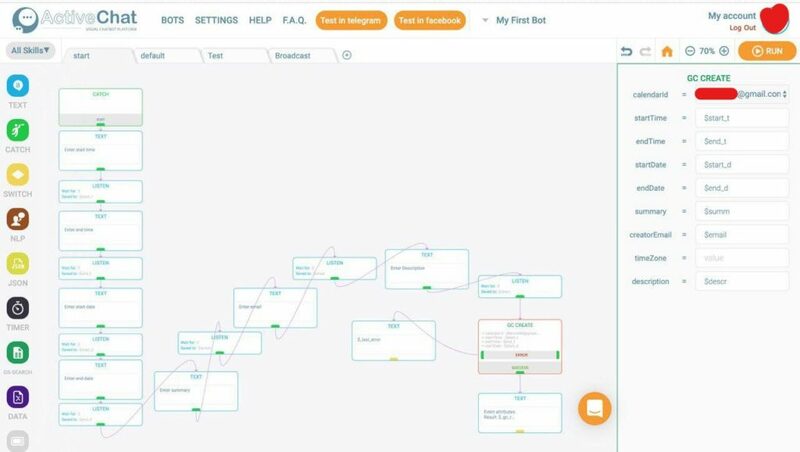 What if chatbot can help you to manage your schedule? Your schedule, meetings is on your chatbot, with Activechat – it’s easier than you think. In this short guide I will show you how to interact with Google Calendar through your chatbot. Go to “Settings – Integrations” and select “Google Services” on the left. Click “Connect” to give Activechat permission to access your Google account and you’ll see the complete list of Sheets in the table. This is for reference only (you will be able to select specific Sheets from this list later in block settings). Now when you have your Google Service account connected to the chatbot, you can use all Google blocks in Activechat constructor. 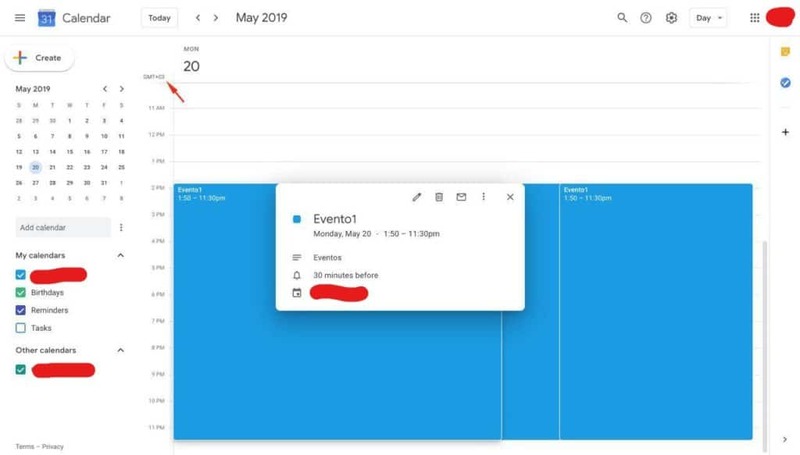 Use the GC Create to Create an event in your Google Calendar. Please note that time should be entered in 24-hour clock format and dates should be entered in yy.mm.dd format. description = Enter the description of your event. 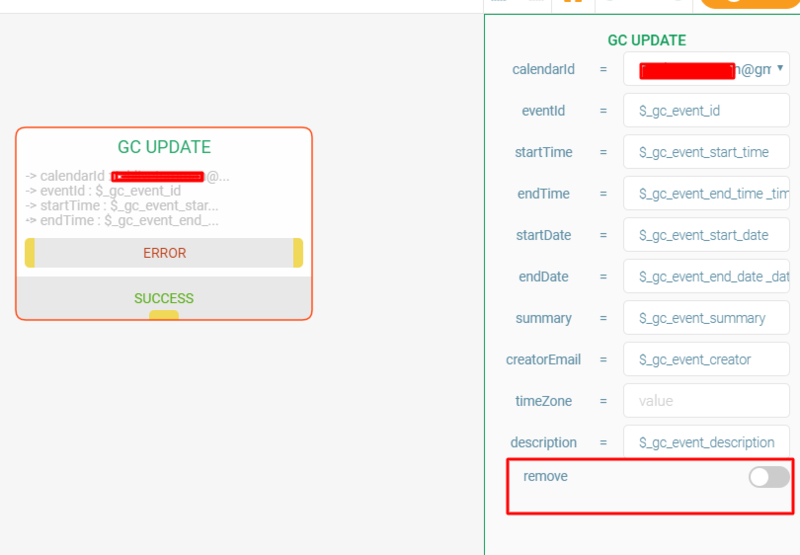 After GC-Create block is executed you can check resulting status with $_gc_result variable (it should contain “Ok” if data was sent successfully). Use SWITCH block to check this if necessary. Do not forget to connect TEXT block (displaying $_last_error system variable) to the ERROR exit so that your bot will inform you if anything goes wrong while executing these blocks. If you do not have anything connected, the blocks will fail silently and you will spend lots of time trying to figure out what’s going on. Use GC Search to check your schedule. In red square will be interval in which it will search your events. 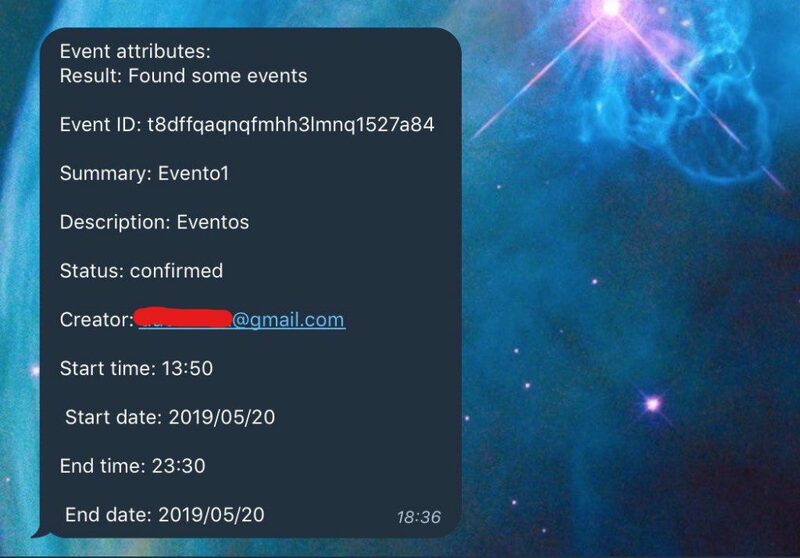 For example, if you have an event in date – 2019/05/13 , you can set interval: dateMin: 2019/05/10 and dateMax: 2019/05/14 . 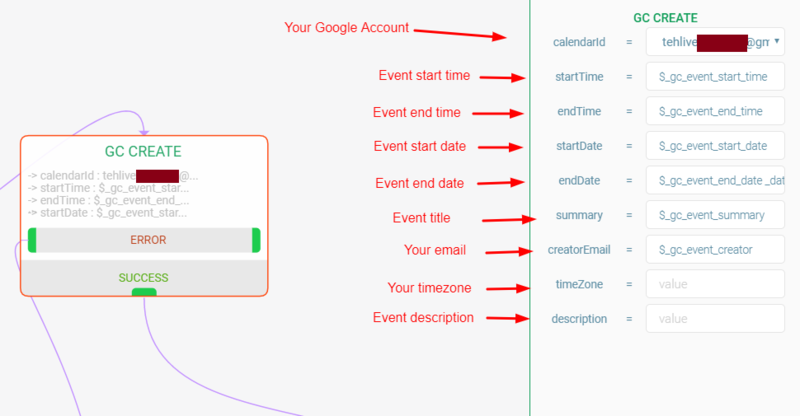 Put it simple – to find event(s) you should just set a date interval in which your event(s) fits. The same thing with a time interval, for example: if you need to find an event which starts in 10:50, place Time max for 10:52. 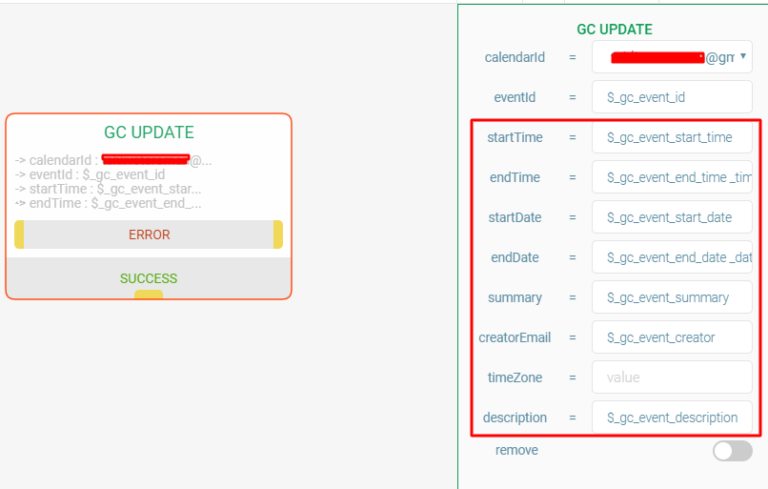 This field is optional in GC SEARCH, it will move your time interval according to your Google Calendar timezone. It’s quite simple. Let’s check it. 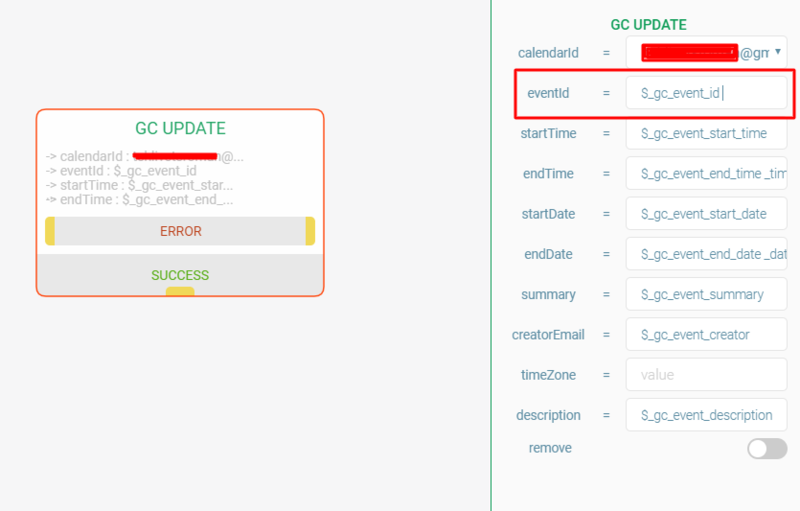 Use our system variable – $_gc_event_id to identify the event which you want to edit. You can toggle the “remove” option if it’s on – the event will be deleted. 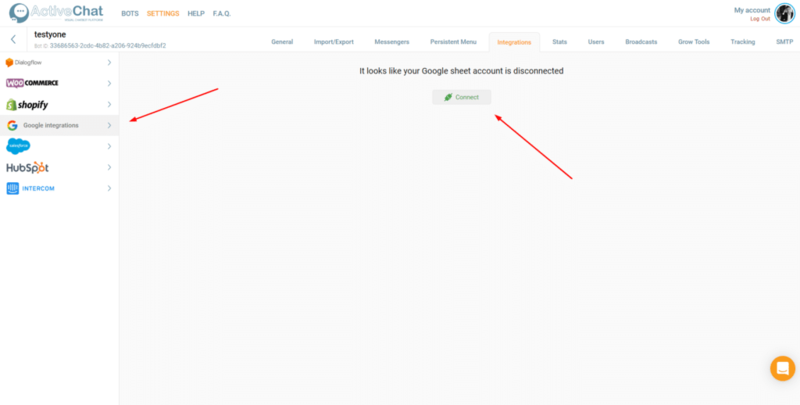 If the toggle is turned off – bot will update the information which you entered.